In 1886, Bankim Chandra Chatterjee presented Krishna as a historical hero in order to create an upper-caste Hindu (anti-Muslim) nationalism. In 1959, Shrii Prabhat Ranjan Sarkar presented Shiva as a historical figure in order to end (global) Aryan arrogance and establish universal humanism. According to Shrii Sarkar (in his seminal discourse “Tantra and Indo-Aryan Civilization”), Lord Shiva was born, 7500 years ago in a non-Aryan community to a Tibetan mother and an Aryan father. Throughout South Asia, countless adivasis and low-caste communities worship Shiva, and some of them practice Tantra, as researchers like Sharad Patil have pointed out. 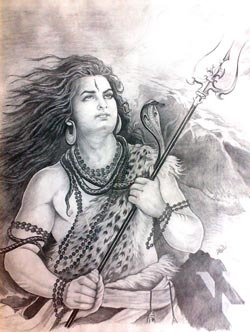 Shiva lived during the beginning of the Aryan onslaught in which the peaceful Austric, Dravidian (Austric mixed with African) and Oriental communities lived. Shrii Sarkar presents the Aryans as brutal, materialistic warriors with no spirituality or culture. The non-Aryans are presented as simple, sublime people who lived in peace with each other and who were intellectually developed and established in Tantra sadhana. It is only after coming in contact with the indigenous Indians that the Aryans learned non-Aryan Tantra and renamed it as yoga. It was only after coming in contact with Tantric philosophy that some of the Aryan ksattriyas (warriors) and sages in the forest began to develop the Upanishads. First and foremost, Shiva created a spiritual revolution that transformed various indigenous people, ground down by Aryan Green Hunts, into revolutionaries. His Tantra sadhana gave these indigenous Indians real spiritual shakti (as is admitted in Puranic propaganda). This shakti transformed prehistoric pasus (animals) into viiras (heroes). The creation of a new humanity, a new divinity, in the prehistoric past still reverberates today. Shiva’s followers, called ganas (though despised by Aryans as dark untouchables), became recognized as the first genuine human beings. Even today, the word gana is used in many Indian languages to signify the authentic people of India. Shiva founded the first cosmopolitan city of Kashi in the East, far away from the Aryans, in order to establish this sama samaja. The conquest of Lord Shiva’s city by the racist Aryans is perhaps one of the greatest tragedies of Indian history.